FERC Order 825 is gradually becoming a reality across energy markets and soon it will significantly impact many areas of your trading business including, energy accounting and settlements as well as data warehousing and reporting. 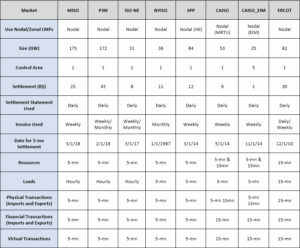 In this post, PCI will examine each of these and highlight a few opportunities to benefit from the increased data granularity of 5-minute settlements that will soon be implemented in MISO and PJM. There are numerous potential benefits as well as costs to consider in submitting 5-minute data and individual market participants will need to decide whether to submit the more granular revenue quality meter data or continue submitting hourly values. What are the costs of submitting 5-minute meter data (Revenue-Quality Data) for resources? What are the benefits of submitting 5-minute meters (revenue-quality) for resources? In short, more accurate settlements, particularly for resources with loadings that fluctuate a lot in real-time (such as wind farms, hydro plants, and combined-cycle resources). For fast moving resources, using 5-minute revenue-quality meter data is recommended because it can increase real-time payments and decrease penalties for generators. For nuclear or coal units, using 5-minute revenue-quality meter data may not have a big impact so, you can probably justify staying with hourly meter data for these stable and slow-moving baseload resources. Note that, in continuing with hourly revenue-quality meter data for generators, the RTO will use either flat or telemetry profiling using the 5-minute state-estimator values to derive 5-minute meter data. How Does the Telemetry-Profiling Method Work? If you submit hourly meter data, RTOs will use either a telemetry-profiling method or flat-profiling method to convert hourly meter data into 5-mn meter data for settlements calculations. Flat profiling simply repeats the MDMA value 12x for each interval. Telemetry profiling shapes and scales the MDMA across 12 intervals using the MDMA value and TELVOL. 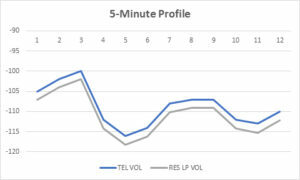 Below is a numerical example to show a typical 5-Minute Profile Calculation, which creates 5-minute data by scaling the Telemetry Volume shape to the submitted hourly MDMA value using the Normalized Weighting Factor (NWF). 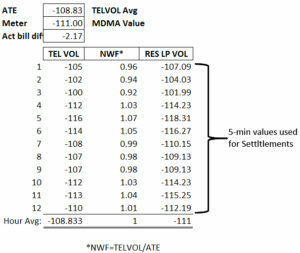 Normalized Weighting Factor (NWF): Ratio of 5-min TELVOL to the average hourly TELVOL used to scale the submitted MDMA meter. Click here for additional details pertaining to MISO. Data Warehouse and Business Intelligence to support back-office reporting will also see a big impact from FERC 825 because of the increased data volume but also due to table and dimension changes needed to support the new granularity. As PCI blogged recently, DART P&L for fast moving resources can potentially increase by 5-30 % under the new rules. PCI is currently helping several market participants to better position themselves in order to benefit from these significant market changes. Please contact us if your organization requires similar guidance during this transition.